Members of the Grand Ducal Family were out and about today to pay their respects to those who fought in the Battle of the Bulge, which started exactly 70 years ago today. The battle was the last major German offensive launched against the Allied Forces towards the end of World War II. Fought in the Ardennes Mountains region of Belgium, France and Luxembourg on the Western Front, it was the largest and bloodiest battle fought by the United States during the course of the Second World War. 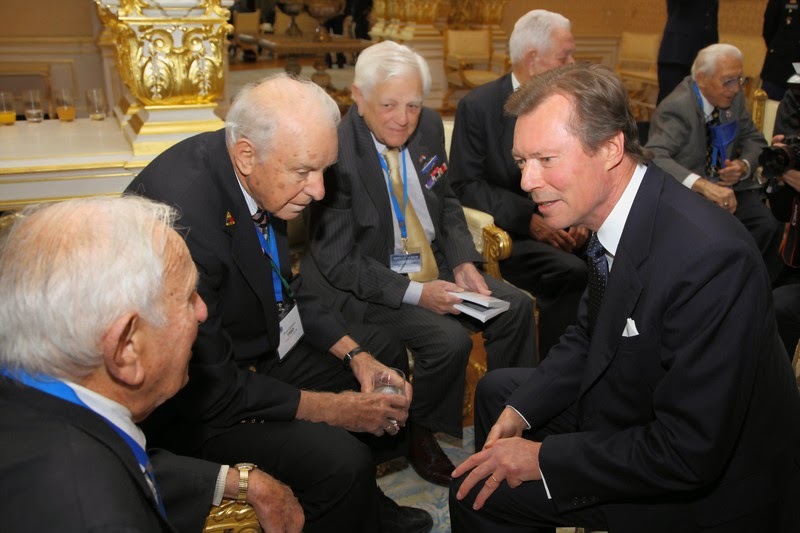 In the morning at 9am, Grand Duke Henri welcomed a delegation of veterans of the Veterans of the Battle of the Bulge association for a reception at the palais. The former soldiers were accompanied by the Ambassador of the United States of America and the Ambassador of Germany to the Grand Duchy. About one and a half hours later, the Grand Duke attended a national commemorative ceremony at the American Cemetery in Luxembourg-Hamm. Other guests at the ceremony included the Prime Minister, Xavier Bettel, the President of the Chambre des Députés, Mars Di Bartolomeo, other government members, as well as the Luxembourg Army Chief of Staff Romain Mancinelli, U.S. Ambassador Robert Mandell, representatives of U.S. armed forces and both American and German veterans that fought in Luxembourg during the Battle of the Bulge in the winter of 1944 and 1945. The ceremony began with a traditional fly-over of four U.S. combat planes (F-16C Fighting Falcon) and continued with speeches delivered by various dignitaries. 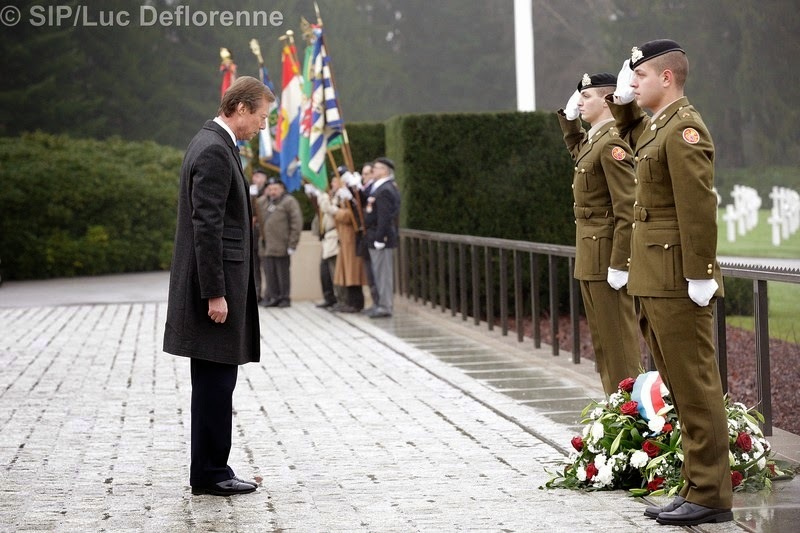 Following these, Grand Duke Henri laid a wreath of flowers to pay tribute to the American soldiers that fought for Luxembourg’s freedom and liberation from Nazi-Germany. 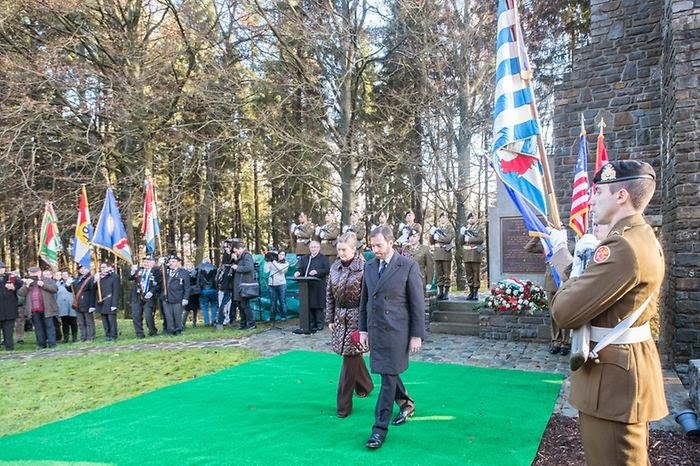 The American delegation then also laid a wreath of flowers, followed by a contingent of American veterans laying 70 roses in honour of the soldiers who died in combat for Luxembourg together with students of the Lycée Technique de Bonnevoie. The ceremony closed with a minute of silence, followed by a three-fire gun salute and the playing of the U.S. and Luxembourgish anthems. In the early afternoon, there was another commemorative event, this time around attended by Hereditary Grand Duke Guillaume and Hereditary Grand Duchess Stéphanie. The couple was among the guests for a ceremony at the National Liberation Memorial (NLM) in Wiltz also attended by the Deputy Prime Minister, Étienne Schneider, and more government ministers as well as American representatives and students from the Nordstad-Lycée as well as, of course, veterans. Wiltz, located in the north-west of the Grand Duchy, probably was the Luxembourgish town to suffer most during the Second World War and a major battleground during the Battle of the Bulge. When German soldiers of the Wehrmacht overran the north of the Grand Duchy on December 16, 1944, the American forces were trapped in the encircled town but managed to hold into until the renewed liberation of the area. More pictures of the day at the cour, the government, Wort, RTL #1, RTL #2, RTL #3 and Tageblatt; videos at Wort and RTL.